Habit: Annual, perennial herb, generally cespitose. Stem: solid, generally glabrous. Leaf: generally basal; ligule generally < 1 mm, generally hairy; blade flat to inrolled, adaxial surface generally puberulent or short-hairy, often ciliate near ligule, hairs long, bulbous-based. Inflorescence: generally panicle-like; branches spike-like, 1 per node, persistent or deciduous in fruit; spikelets 2-rowed on 1 side of axis, overlapping. Spikelet: sessile or short-stalked, +- cylindric to laterally compressed; glumes generally unequal, generally lanceolate, 1-veined, upper glume firmer than lower; axis (if inflorescence branch persistent) breaking between glumes and lower floret; florets generally 2--3, lower floret bisexual, > upper, upper floret(s) generally reduced, sterile; lemma 3-veined, generally 3-awned, awns straight, scabrous; palea +- = lemma. Species In Genus: 57 species: America. Etymology: (Claudio (b. 1774) and Esteban (b. 1776) Boutelou, Spanish botanists, horticulturists) Note: Many species important for forage. Habit: Annual. Stem: decumbent to erect, 0.5--3.5 dm. Leaf: blade < 7 cm, < 2 mm wide. 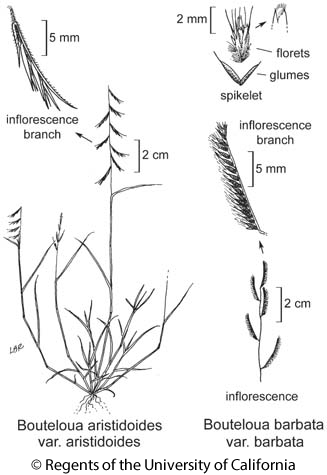 Inflorescence: branches 4--16, 8--25 mm, pendent to appressed, deciduous in fruit; branch axis prolonged beyond terminal spikelet node generally > 5 mm, base densely short-hairy; spikelets 1--4 per branch, generally appressed, falling with branch. Spikelet: upper glume 5--7 mm, glabrous or hairy, acute; florets 1--2; lower floret lemma +- = upper glume, glabrous or hairy, lobes 0, awns 0 or 2, lateral, < 1 mm; base of upper floret (if present) hairy-tufted, lobes generally 0 between awn bases, awns 2--7 mm, generally unequal. Chromosomes: 2n=40. Ecology: Dry, open, sandy to rocky slopes, flats, washes, disturbed sites, scrub, woodland; Elevation: < 1800 m. Bioregional Distribution: e PR, e&s DMoj, DSon; Distribution Outside California: to Utah, Texas, southern Mexico, South America. Flowering Time: All year Note: Other variety in Arizona, New Mexico, northwestern Mexico. Citation for this treatment: J. Travis Columbus 2012, Bouteloua aristidoides var. aristidoides, in Jepson Flora Project (eds.) Jepson eFlora, http://ucjeps.berkeley.edu/eflora/eflora_display.php?tid=55240, accessed on April 26, 2019.
e PR, e&s DMoj, DSon; Markers link to CCH specimen records. Yellow markers indicate records that may provide evidence for eFlora range revision or may have georeferencing or identification issues. Purple markers indicate specimens collected from a garden, greenhouse, or other non-wild location.